In I Wore My Blackest Hair (Little A, 2017), Fulbright grant and Edna Meudt Memorial Award recipient Carlina Duan delivers an electric debut collection of poetry. With defiance and wild joy, Duan’s poems wrestle with and celebrate ancestry and history, racial consciousness, and the growing pains of girlhood. They explore difficult truths with grace and power. I Wore My Blackest Hair is an honest portrait of a woman in-between—identities, places, languages, and desires—and her quest to belong. The speaker is specific in her self-definition, discovering and reinventing what it means to be a bold woman, what it means to be Chinese American, and what it means to grow into adulthood. Duan moves seamlessly from the personal to the imaginative to the universal, heralding a brilliant new voice in contemporary poetry. Digital Book Giveaway by Goodreads. 14 New Poetry Collections That Will Expand Your Worldview. Bustle. Love Letters to Michelle Obama, a Biography of Stevie Nicks, and the 8 Other Books to Read Right Now. W Magazine. Must-Read Poetry: November 2017. The Millions. Interview: Carlina Duan. The Kindle Chronicles. The PEN Ten with Carlina Duan. PEN America. AAWW: 13 New Books by Asian Diasporic Writers. Asian American Writers Workshop. The 13 Best Books To Read In January. Oprah Magazine. Exploding Language and Language About An Explosion. Current Magazine. I Wore My Blackest Hair: Two poems. The Margins. 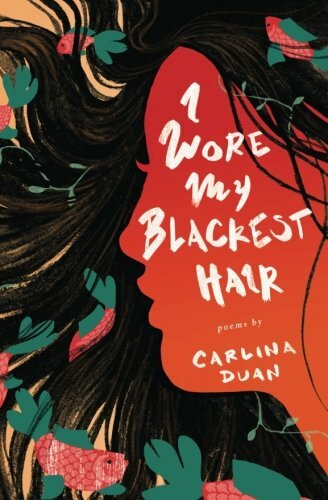 Carlina Duan navigates identity and belonging in 'I Wore My Blackest Hair.' The Michigan Daily. Blackness In-Between: A review of Carlina Duan's 'I Wore My Blackest Hair.' re:asian. I heart meeting readers! If you want to talk to me about the book or buy a copy from me directly, let me know via email at carlinawrites@gmail.com.